For seven years, the Republican party’s platform has prioritized the repeal and replacement of the Affordable Care Act (also known as Obamacare), which currently covers 70 million people, an initiative deemed too expensive and disastrous by conservatives. After nine months of the Trump presidency and a majority in the House and Senate, Republicans still haven’t been able to accomplish that goal. Most recently, a form of the repeal and replace bill known as the “skinny repeal” failed to secure the votes of key Republicans who were concerned with its Medicaid cutbacks and overall lack on the “replace” side of the plan. A surprise no vote from Senator McCain (AZ), who was dissatisfied that the bill had no proper hearing though it would have major implications for Arizona, prevented the bill from passing. Republicans now have the deadline of September 30, when their allotted time to repeal and replace ACA will expire. The revised form of the bill that has been introduced is called Graham-Cassidy, after the Republican senators Bill Cassidy (LA) and Lindsey Graham (SC) who crafted it. Like with the “skinny-repeal” in July, three Republicans must vote no for this bill not to pass. Democrats are looking to the same three Republicans who opposed it earlier— Susan Collins (ME), Lisa Murkowski (AK), and John McCain (AZ), none of whom have officially endorsed the Graham-Cassidy bill. The Graham-Cassidy bill would essentially repeal major provisions of the Affordable Care Act by disbanding certain programs that created through it, eliminating certain regulations, and relegating the money from these programs to the states. The money would be distributed through a block grant program, however, the share of money given to each state will likely be dependent on the state’s history with Medicaid expansion. Critics are concerned that blue states that have expanded Medicaid programs would be slighted, while the red states that did not expand Medicaid would be rewarded with more funding. Proponents, on the other hand, advertise the “flexibility” that would come from the passing of this bill. With this system, states would be enabled to enact their own health care systems. They also argue that the rearrangement of funds would address a current imbalance in which only four states receive a third of federal money for their health care systems. While this bill could potentially create some medicare-for-all victories through single-payer experimentation in progressive states like California, which has had a plans for such an initiative, there could be major drawbacks in access to affordable health care in states willing to privatize options. States would have the power to deny coverage to Americans by waiving the requirements for large employers to provide healthcare to employees and guarantee care for those with pre-existing conditions (health problems formed before the date the new coverage starts). Insurers would even be allowed to charge higher premiums to groups in need of maternity care, mental health care, or treatment for addiction. Democrats demand a full analysis from the Center on Budget and Policy Priorities before the vote, but according to the CBP, this could take several weeks. The Republicans, seeking to pass Graham-Cassidy by the end of the week, aren’t going to comply. So far, the CBP has estimated that Graham-Cassidy could cause 32 million people to lose coverage in the next ten years, and 400 billion dollars would be cut from the federal funding of health care. Medicaid would get the worst of the deal, leaving about 15 million people without access. Republicans have come under attack for being unable to clearly defend Graham-Cassidy or explain how it would improve access to health care for average Americans. However, this is no surprise as many Republicans were willing to go forward with a “skinny repeal” with no plan for replacement in store. Graham-Cassidy is facing strong criticism from major physician organizations, as well. The American Medical Association, Psychiatric Association, Public Health Association, and the National Institute for Reproductive Health have all released statements against the bill’s implementation. Doctors agree it would be a step backward for health in America; Securing health care for all is vital for creating a generally productive and able society. The guaranteed access to affordable medical care for anyone who needs it is at stake. Democrats are counting on their republican colleagues, specifically Sen. McCain, to vote against Graham-Cassidy and prevent millions of Americans from losing their coverage. 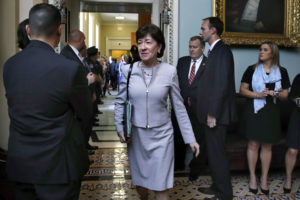 Senators Graham and Cassidy however, feel confident that their bill is gaining momentum, and the Republicans will finally come through in dismantling the Affordable Care Act. And they have reason to think so. For Sen. McCain to vote no, he would have to vote against a bill proposed by his longtime friend and collaborator in the senate, Lindsey Graham. The pressure is on in Washington now, but with a win for Graham-Cassidy, fifty states, and millions of Americans, would feel that pressure for years to come. First-year Nina Kegalman is a contributing writer. Her email is nkegelma@fandm.edu.